While 30 Rock has been the critical darling for the past half decade of so, Parks and Recreation has moved up past 30 Rock on many a person’s rankings (including mine, obviously), and that’s quite understandable. Parks and Recreation is still in its growing phase, or at leas near it. The show continued to get better and perfect itself over this past season, it’s third, and has been as strong as ever in the first few episodes of the fourth. In reviewing some comedies in this new television season, I’ve talked about how difficult it is to be great from the beginning with a comedy. The actors have to learn how to best portray the characters, and the writers have to learn what works in a way that can only be established in actual episodes. Like in sports, unfortunately, not everything can be worked out during the preseason. 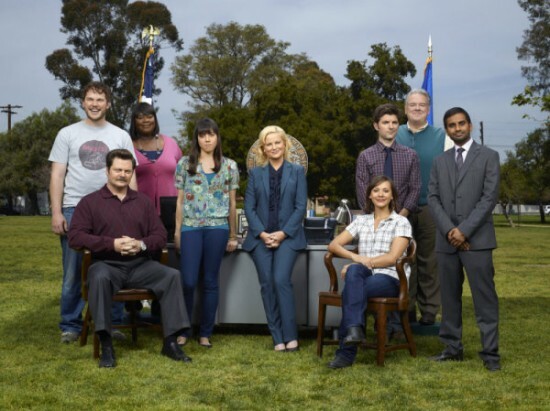 There are many, many examples of this phenomenon – comedies finding their footing and improving greatly over the first season or two – but Parks and Recreation may be the single most dramatic in recent history. When the show first started, I had mixed emotions. I was excited, because it was created by Michael Schur, who was largely responsible for firejoemorgan, the fantastic blog which made fun of dumb sports commentary, but I was wary because I’ve never liked Amy Poehler. The premise of the show at the time was that Poehler’s parks and recreation department employee was determined to turn a hole in small Indiana town Pawnee into a playground after Rashida Jones’ character Ann Perkins’ boyfriend Andy Dwyer(Chris Pratt) fell in and broke his legs. I watched the first couple of episodes, and it confirmed my biggest concerns. It had plenty of good points but Poehler’s government do-gooder overachiever Leslie Knope was so over the top that it overshadowed everything else. It was a poor Michael Scott impression at best, and although Scott’s never been my favorite character, Poehler certainly couldn’t pull it off like Carrell. I stopped watching. Mid-way through the second season, people and the internet kept trying to tell me to come back. I was skeptical, after having seen part of the first season, but it was people and internet I trusted, and it was still a good creative team, so I relented. I’m glad I did. The show was well on its way in its transofrmation to one of the best comedies on television. The biggest single difference may have been that the writers pulled the reins in on Leslie. Instead of an overbearing Michael Scott like character, she was aggressively competent, and relentlessly well meaning, making her touch of crazy which still existed more endearing than obnoxious, generally. Even better, the supporting cast had come out of its shell. Andy, the deadbeat boyfriend in the first episode originally planned to only appear in a couple of episodes, changed completely into a lovable happy go lucky but delightfully a little bit slow witted character who has become one of the breakout characters of the show. 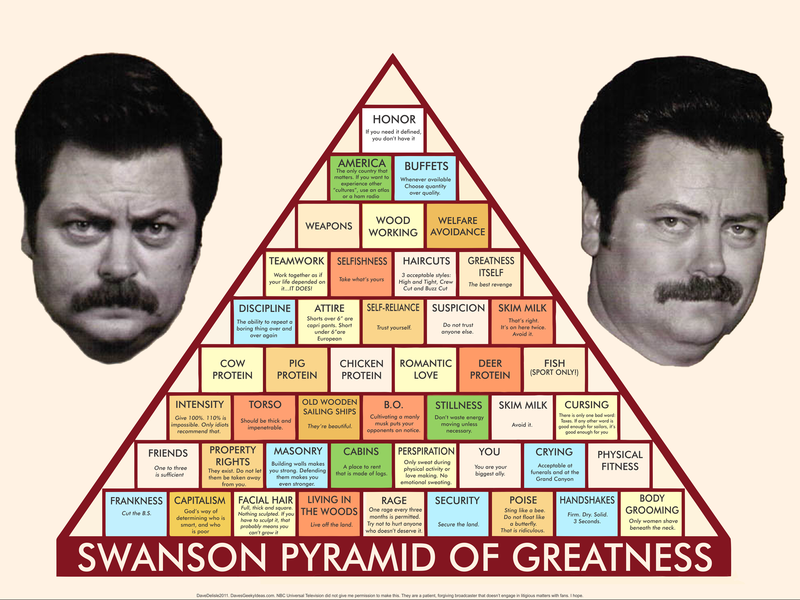 The other biggest breakout character was mustachioed boss Ron Swanson, played by Nick Offerman, whose anti-government libertarian positions meant he left all the work for Leslie, and who offers lines, which even completely out of context sound wonderful like “You had me at meat tornado,” and produces the Ron Swanson Pyramid of Greatness, shown below. The fact tha these characters have broken out so successfully, has obscured who I thought would be the obvious breakout character, Aziz Ansari’s Tom Haverford, whose fantastic renaming of food quote (I cut some of it, but it’s so good I didn’t want to leave out too much)”Fried chicken is fry fry chicky chick. Chicken Parm is chickey chickey parm parm. Chicken Cacciatore chickey catch. I call eggs pre-birds or future birds. Root beer is super water. Tortillas are bean blankies. And I call forks food rakes.” inspired a fantastic website, Tom Haverfoods. This reorganization of the show left one odd man out, Paul Schneider, who played Mark Brendanawicz, another government worker who was friends with Leslie. Originally designed as loosely the Jim Halpert character, Brendanawicz’s role kept getting squeezed as the show continued until he chose to leave, which was the best thing for the show. He was replaced by Adam Scott and Rob Lowe joined the cast as well at the end of the second season. Even as the third season started, it was hard to remember that Schneider was ever on the show. I have had a man-crush on Adam Scott ever since Party Down, and he does a fantastic job portraying awkwardness as Ben Wyatt. Why It’s This High: Making Amy Poehller make me laugh is something I never thought would happen, and this does, and still not nearly as much as Ron or Tom or Andy. Why It’s Not Higher: We’re at the point where there really aren’t great reasons why it isn’t higher, it’s very good, though I suppose I still don’t totally love Amy Poehler – old annoyances die hard. Still, these are quibbles. Best episode of the most recent season: I’ll pick from the third season, since it’s the last fully completed (arbitrary explanation, granted) and there’s really no obvious top episode or even couple of episodes as there are with some shows. Without spending too much time to parse every individual episode’s A, B and C plots, I’ll go with “Eagleton” where there are some fantastic depictions of Pawnee’s rival town, the much richer Eagleton. Although there’s a risk of occasional overuse, Parks and Recreation has gotten a lot of mileage from its depiction of residents of Pawnee as largely idiots, and its less frequent depictions of everything regarding Eagleton as snooty and ostentatious. As much as I hated Amy Poehler’s in season 1, she’s no Michael Scott. Probably the worst main character on a good show ever Ron Swanson is my personal hero.